Unlike fire or flooding, a malfunctioning sanitation system is far from an emergency. However, it does represent the failure of a key system and when that system does go down it certainly can ruin your day, your spouse’s day, and the day of your guests. If you are on an extended cruise, or if you live aboard, then a hotel starts to look pretty appealing. That’s the bad news. The good news is nearly every sanitation system malady I’ve encountered could have been prevented, often easily and inexpensively. In many cases, the problem arises from the use of poor quality or the incorrect materials. In other cases the problem lies in the system’s design. Undoubtedly, among the most common complaints that many boat owners and I lodge against sanitation systems is their foul odor. I’ve set foot aboard far too many vessels that suffered from this issue; some new, others decades old. Yet, in other cases, I’m almost surprised when I go aboard an older vessel whose bilges are sweet smelling and odor-free. Rest assured this is no accident, preventing sanitation system odors from escaping from the tank and hoses in which they reside takes planning and proper material selection. When sanitation system odors end up on the wrong side of the hoses and tanks that are designed to contain them, the most frequent analysis is, “they are permeated” and the suggestion I hear calls for wholesale hose replacement. In fact, while this may ultimately be necessary, it’s often a case of addressing the symptom rather than the cause. If the hoses are replaced and the design is flawed, then it’s likely the new hoses will, once again, fail or permeate prematurely. A quick test for permeation works like this: Take a well-used cotton washcloth and rinse it thoroughly to remove any surfactant or scent. Saturate it with hot water, wrap it around the suspect hose, and leave it there for a minute or two. Remove it from the hose and immediately place it in a ziplock bag. Carry the bag off the boat, head upwind to a protected location, open the bag, and sniff. If you smell no effluent, it’s unlikely the hose is permeated, at least not in that location. If any hose shows signs of growth or mildew (I‘ve seen mushrooms growing on permeated sanitation hose, a hydroponic, effluent garden of sorts, yuk), that’s a clear indication the hose is permeated and needs to be replaced. The greatest challenge for a sanitation system hose involves standing effluent. It’s not a pretty visualization, but bear with me. When these hoses are installed in such a way as to create large dips, low spots, or U-shaped bends, effluent will settle in these areas making life difficult for even the most permeation-resistant hoses, as well as increasing the likelihood of clogging. The best course of action involves eliminating such dips, and barring this, replacing them with sections of rigid PVC sanitation pipe. A frequent location for such a scenario is at a holding tank whose fittings are located on the bottom or lower side of the tank (an undesirable design trait). Hoses attached to such fittings are continuously submerged in effluent, making permeation a veritable certainty. 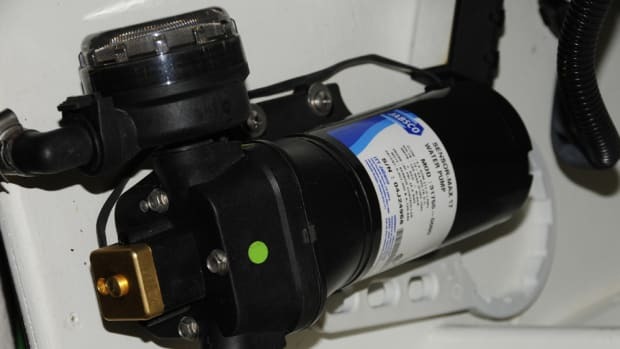 In this case, the solutions are: relocation of the fittings to the top of the tank and using a drop or dip tube, installation of rigid PVC or fiberglass tubing in place of the hose where it will be submerged, or replacement of the tank with one that does not rely on bottom fittings. If the dreaded odor does rear its head, don’t jump to conclusions regarding the hose and its possible permeation. Because of its concentrated nature it takes but a few drops of ripe effluent to engulf an entire vessel. Therefore, you should first conduct a careful inspection, looking for even the slightest sign of leakage before engaging in a hose replacement project. I’ve encountered cases where a single loose hose clamp was found to be the culprit. 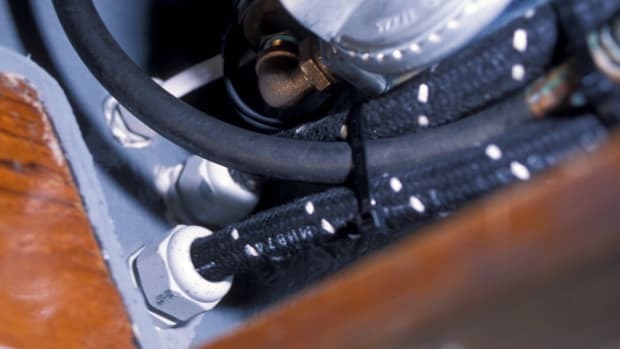 All connections and fittings are possible leak sources, including pumps, Y valves, and anti-siphon loops, and especially stainless steel components. If the initial visual inspection yields no results, clean the area where sanitation system plumbing is located using soap, water, and a mild bleach solution, then rinse thoroughly and let dry (a fan will speed the drying process). Once the area is completely dry, lightly sprinkle baby powder around all connections and hose fittings. Leakage will often be easy to spot as a trail or drops in the powder. Yet another design defect many sanitation systems suffer from is inadequate ventilation of the holding tank. Holding tanks become especially smelly because they are oxygen-poor environments, where anaerobic bacteria, the kind that stink, thrive. It’s why vent line filters have become so popular. Therefore, keeping the tank supplied with fresh air wards off this type of critter and the odor it produces, making filters unnecessary. Proprietary systems such as Groco’s SweetTank are one way of accomplishing this. Or, you can simply plumb two vents, the larger the hose diameter the better, into the tank and route them to opposite sides of the boat. Usually, the slight difference in pressure caused by wind alone will create a cross flow and the desired ventilation. If the sanitation system’s design is sound, then all that remains is to ensure the system is installed properly, using the correct materials. If you are in the mood for a debate on the dock or on one of the marine forums, mention your favorite sanitation hose. While many manufacturers make lofty claims, few hoses are actually permeation-proof, at least not forever. If you want an indefinite, zero-permeation guarantee then you’ll need to use PVC pipe. Otherwise, look for a hose that has at least a five-year warranty against odor permeation. I’ve had excellent success with Trident Marine Systems’ Sani Shield. I’ve installed miles of this EPDM, high-clay content “rubber” hose over the years and to date have never removed a foot as a result of permeation. There are others; simply select from a reputable manufacturer and ensure the warranty is at least five years. Pipe fittings should be installed using a thread sealant that is designed for effluent. Manufacturers of heads, holding tanks, and other sanitation system components are typically very specific about sealant use. Check with the manufacturer of your product(s) to be certain you are complying with their recommendations. Additionally, avoid the use of sealant when installing hose over or onto pipe-to-hose adapters. In some cases, the sealant can actually create a leak path, especially if it’s affected by chemicals used in the system, or it may form a blockage within the hose. And, it can make removal of the hose nearly impossible. When installed dry (hose may be lightly lubricated with dilute dishwashing detergent) and double clamped, sanitation hose connections should be entirely liquid-tight without the use of sealant. One additional hose caveat bears mentioning. Most PVC sanitation hose (they are typically white and plastic-like, rather than rubbery) manufacturers prohibit them from being used with alcohol or other solvents. This includes the pink, non-toxic, winterizing antifreeze. If left standing in PVC sanitation hose over the winter it will often permeate and even soften the hose (I’ve seen some hoses turn pink on the outside, a clear indication the fluid has penetrated the hose wall). Once sanitation hose has been so affected, it’s been compromised and is unlikely to remain odor free.